“The response to mHUB in its first year has been nothing short of extraordinary and is testament to the fact that the industry was hungry for collaborative innovation,” said Mayor Rahm Emanuel. mHUB, the physical product innovation center that’s galvanizing the manufacturing ecosystem and creating the conditions for product innovation to thrive, celebrates its one-year anniversary today. The community, that boasts 63,000 sq.ft. of co-working, event space and 10 fabrication labs with nearly $5M in prototyping equipment and software, has attracted over 650 community members and 100 industry and community partners in its first year, and has quickly become the central hub for the region’s vibrant manufacturing ecosystem. mHUB offers Chicago’s burgeoning product innovators a connection point to the larger community by partnering with established manufacturers, business accelerator programs, venture capitalists, universities, and providers of industry-specific business services. mHUB has launched a mentorship program and series of courses along with hands-on equipment training sessions to give members the broadest set of resources to take their ideas from prototypes to new products that will support sustainable businesses. Launched industry awards with IMEC and UILABS, The Fourth Revolution Awards. Seven industry awards including “Startup of the Year,” and “Manufacturer of the Year”. “It’s inspiring to support the careers of emerging entrepreneurs especially female entrepreneurs through mHUB’s mentorship program. I’m motivated by mHUB’s mission to become a community for STEM entrepreneurs from across Chicago’s neighborhoods, and it has already proven to be a valuable resource for BWISE to convene, inspire one another’s professional development, and gain access to mHUB’s remarkable resources,” said Leslie McKinney, director of the Chicago chapter of Black Women in Science and Engineering (BWISE) and mHUB mentor. A key component to mHUB’s mission is to drive collaboration between product entrepreneurs and industry partners. mHUB has welcomed Grainger, UPS, Wintrust, Bank of America, Desault Systems, Stratsys and Fisher Unitech as new industry partners this year to support product innovation and technological advancement. These companies join mHUB’s original partners: Marmon, Arrow Electronics, Chamberlain Group, Chase Foundation, U.S. Economic Development Administration, GE Ventures, Kirkland & Ellis, UL, World Business Chicago, Motorola Mobility, Autodesk, JLL, Technology and Manufacturing Association (TMA), Comcast Business, Wiegel Toolworks, Ask Power, IFF, KPMG, MINIMAL, Inventables and Solidworks. mHUB is creating the conditions for product innovation to thrive. Our mission is to galvanize Chicago’s manufacturing ecosystem by generating innovative ideas, attracting world-class talent and fostering collaboration. By providing access to labs and equipment, industry experts and workshops, and a community of other product innovators, mHUB helps turn ideas into prototypes, and prototypes into sustainable new businesses that drive economic impact, and ensure the region’s continued leadership in global manufacturing. Membership rates at mHUB start at $145 per month for part-time access to the prototyping shop. 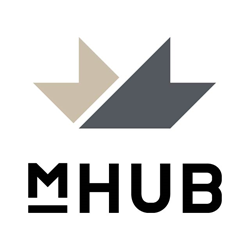 mHUB offers several packages for early stage entrepreneurs up through established enterprises, including shared co-working space and private office rentals within mHUB. For more information, visit http://www.mHUBChicago.com and follow us on Twitter, Facebook, Instagram and LinkedIn.